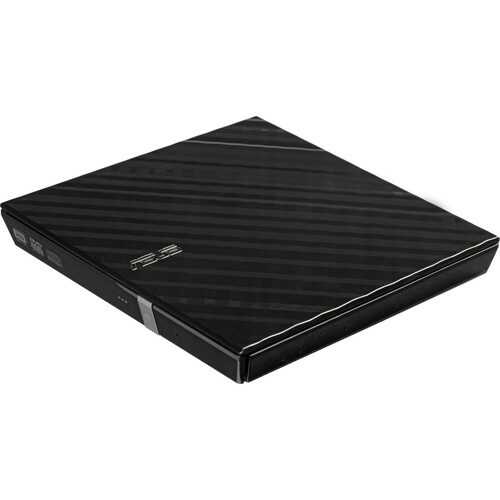 The black SDRW-08D2S-U/B 8X Slim External DVD+RW Optical Drive from ASUS features enhanced encryption standards complete with password protection and the ability to hide files within the disc. The process of burning files to the disc has also been simplified with a drag-and-drop burning interface. This optical drive supports a variety of disc formats including Audio CD, Video CD, CD-I, CD-Extra, Photo CD, CD-Text, CD-ROM/XA, Multi-session CD, CD-R, CD-RW, CD-ROM , DVD±R(SL/DL), DVD±RW, DVD-ROM(SL/DL), DVD-RAM, DVD Video and support for up to 8X DVD burning speeds and 24X CD burning speeds. Box Dimensions (LxWxH) 7.3 x 7.2 x 2.8"
SDRW-08D2S-U/B 8X Slim External DVD+RW Optical Drive (Black) is rated 4.1 out of 5 by 54. Rated 2 out of 5 by James G. from Won't use it with my Mac products This product I could not use with my Macbook. Downloaded the software and tried to play movies and it was skipping and freezing the entire time. But my primary use was for burning CDs of pictures to give to clients and it was a fail. Ended up going with the Mac version! So much simplier and smooth. I am sure it would work great with a PC but this, in my experiene, was not easy to use and did not work properly on my Mac. Rated 2 out of 5 by FrostyNutSickels from decent , gets the job done While it does what it is supposed to, it's loud and it did not come with the stand. So I have to place it flat and the vibration is enough while working to make my mouse move on its own. So basically it works but no stand,bit disappointed as I would have gotta something else if I knew it would be flat and not vertical. Shipping was fast .. Rated 5 out of 5 by Rufus from Nice looking, compact, functional Used as an external/portable CD/DVD player/burner for several machines. Is instantly recognized by Windows 7 and is available for use in a matter of a few seconds after being plugged in. It needs two USB ports but no other external power source. Rated 4 out of 5 by bimotabob from simple, easy to connect, works great The reason I did not rate it five stars is some times on high end videos it gets a little noisy. For the price it is a great drive audio is excellent and data not a problem. I thought I could live without a disc drive on my netbook but I was wrong. This item is a great add on plus it is the same make as my computer. Rated 4 out of 5 by Jason from Does the job Product does the basic of job of reading and writing DVD/CDs. Not an amazing build quality (light-weight plastic), but considering the price, it meets all expectations. Rated 5 out of 5 by Blueap06 from Might get another one as a gift Works great with both my Mac and PC. Rated 4 out of 5 by Knut from PC or Mac - works for me Cheap and works, right out of the box. I needed a CD/DVD player for my Macbook Air and my Acer laptop. This worked fine on the first try on both. Have not tried to burn anything yet. Plastic seems frail, might not be good for heavy duty travels. What are the DVD-R DL andDVD+R DL) Write speeds? Both the DVD-R DL and DVD+R speeds are 8x. will this burn cd+g ? Multi session burning can be done on any drive. It is software dependent. For example with Power2Go (http://bhpho.to/1Qa4YoW) you can uncheck the Close Disk box on the burner tab until you are done adding data to the disk. I lost the cable. Any idea how to work around that? I'm not finding any cables that seem to work apart from the cable in the box. You need a new cable with two USB 2.0 connectors on the computer end. Many power supplies have sufficient power with just one of these plugs connected. On the other end a USB 2.0 MINI-B 5 pin is required for connection to the drive..
does this come with the stand? Will this work with asus chromebook?? I tried it with a mac mini and returned it. It may have worked with the Apple OS but it requires 2 usb ports. So I would suggest that you check for OS compatibility and make sure that you have 2 usb ports free. can you watch dvd movies? will this work in windows 10? As of this writing there are no drivers mentioned for Windows 10. The last drivers released were for Windows 7 but they do claim those were compatible with Windows 8.